I have a secret that has recently been forced out into the light, so I may as well share it. It’s not the deepest, darkest secret in existence, but it’s embarrassing. There is something most people have done well before they are in their thirties, and sadly I never had. I never read To Kill a Mockingbird. I’m not sure how this happened. I could blame the various schools I attended, because I’m fairly certain most kids are forced to read this book whether they like it or not. It was certainly nothing that was presented as part of the curriculum and I skipped out on it, because I love to read even if it’s assigned. 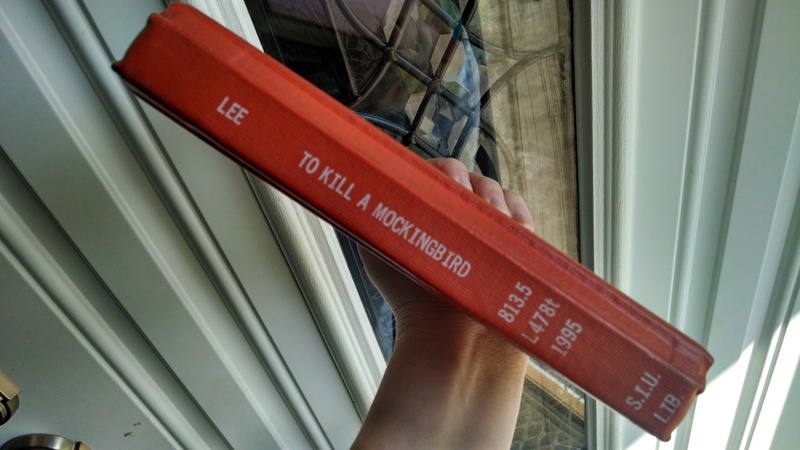 I discovered the discrepancy when a discussion arose about To Kill a Mockingbird during a class I’m taking, and I was certain I was the only person who hadn’t explored this typical tome of teenage tutelage. So I checked it out from the library (hoping not to have to make an excuse and say it was for my kids, who are far too young to read it). I finished the book last night, and here’s what I have to say: Wow. Just plain, flat out, wow. Where had this book been all my life? There was so much voice, the characters were amazing, and I found the plot gripping. To Kill a Mockingbird addresses every kind of prejudice available: white vs. black, class vs. class, and even disabled vs. not. It’s a story of growing up and realizing how the world around you really works. I can see why this is part of (most people’s) education. As I finished the last page and shut the book, I made my spouse pause the movie he was watching so I could tell him how amazed I was. The poor thing probably didn’t really care, but he humored me and told me he was glad I liked it so much. This book has started a trend for me of catching up on the classics. Sure, I’ve read Treasure Island three times, and absolutely adored Twenty Thousand Leagues Under the Sea, but my booklog is sadly devoid of many of the classics. That’s kind of pitiful for a bookworm like me. Next up? Don Quixote, followed by Kafka’s Metamorphosis. If you have other recommendations, feel free to hurl them my way! If you liked this post, be sure to check out more of my work on Amazon. Lol thanks! It really was an impressive read. Did your closeness to the setting make it more real for you? I would say growing up in the South and knowing the descriptions well adds to it. And of course knowing people like those in the book. Racism was still a big part of things when I was little. I may have to write an article about that one day. I may have mentioned some of it in that article I mentioned. I would have to read it again. But even still, it might be a good idea. Seeing your cousin tied to a tree and being whipped by the KKK alongside his black friend can have a lasting impression upon your life. Yeah . . . I think I need to write that article. Thank you for the inspiration. I’m going to link back to your article here once I complete it if you don’t mind. I certainly don’t mind a bit! I look forward to reading it. Les Miserables – I read it about once a year, maybe once every two. Thanks! I’ve not read it but I remember enjoying the older movie with Liam Neeson. I really wish I could say I liked the new one. The stories from both are hugely, hugely abbreviated from Hugo’s masterpiece. Now, there are times when it slows a bit (remember, they were paid by the word back then), but so much detail and characterization is lost in the attempt to translate so massive a work into a two or even three hour film. The movies are never as good as the books, that’s for sure. I read TKAM in junior high, so it’s been a while for me, but I remember being mesmerized. I still haven’t read War and Peace or Anna Karenina. I’m waiting for when I have six solid months to kill so I can attack either of these books. Not exactly light reading! Hoping to tackle those someday myself. I loved To Kill a Mockingbird! After Possession (of which I have 107 pages to finish),I too will read Kafka’s Metamorphosis and other stories. I would recommend The Picture of Dorian Gray,The Great Gatsby,Brave New World and Lord of the Flies,which are perhaps among the most easiest classics. For more classics,you can check out my to-read list on my blog.I read mostly classics and have made a list of books I have read and plan to read. I’m glad to know I’m not the only one who keeps a list of books they’ve read! I only wish I had started it a long time ago, because I know there are many books still missing from it. The library has lost Metamorphosis, so hopefully they can find me another copy soon. I’ve read a lot of books, but I wonder why if we don’t read the classics we think we’re not cultured? Of course instead of backlashing against that idea I’m just scrambling to read more lol. My article comes out tomorrow and I linked back to you. I hope you still don’t mind. Thanks for stopping by my blog. To Kill a Mockingbird is probably my all time favourite book. I read it as a teen in school and now my daughter has read it too (it’s still on the Irish secondary school reading list forty years later) Oops! Now you know I’m ancient. Harper Lee only ever published that one novel, but what a story, and it received a Pulitzer Prize for Fiction a year after being published. I haven’t. I’ll have to put that one on the To Read list! Thanks for your input! I have tried to read Catcher in the Rye four times now. Still haven’t gotten even halfway through!